Summary: Man Flow Yoga is different from other strength training or yoga programs. It makes getting and staying in great shape very easy. You only need to invest 20-30 minutes a day to see results. This is because you will be doing the right exercises to keep injury-free, mobile, and healthy. START YOUR 7 DAY TRIAL FOR $1! Yoga is great for men! There are so many benefits to doing this ancient activity. Unfortunately the western world view is that yoga as an activity that only benefits women. But by not doing yoga you are missing out on arguably the best activity to achieve your fitness goals. 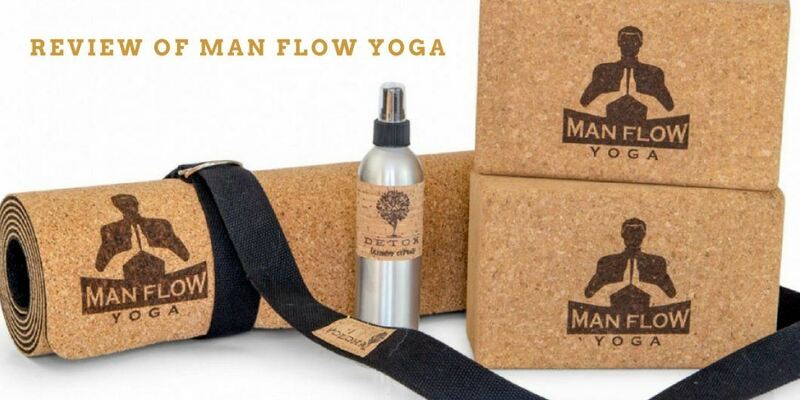 Man flow yoga is a product that offers no nonsense fitness-centric yoga. It is functional yoga in line with your fitness goals. Are you looking to increase your power and strength? Man flow yoga workouts have many body-weight exercises that will build lean muscle. You will increase your strength and see significant improvements in athleticism. Do you have limited flexibility and mobility? Yoga is the number one activity for increasing flexibility. Man flow yoga workouts will focus heavily on extending your flexibility. Developing a wider range of motion throughout your body will increase your power. Are you injury prone or struggle to recover from injuries? Yoga offers the best balance of strength training and body maintenance. It will improve your body's efficiency allowing you to stay active and healthy for longer. Man flow yoga workouts will improve your fitness and sports performance. You will develop better body awareness and control and see improvements in balance and stability. Finally say goodbye to those nagging knee or back pain during exercise. Dean Pohlman is the founder of Man Flow Yoga. His journey into Yoga is common among many who have been active in sports and fitness from an early age. A history of injury from his early teens resulted in many surgeries but none of them provided the required solution. 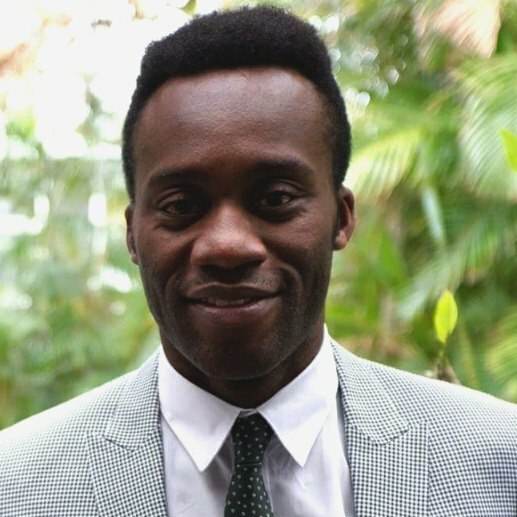 As he grew older he developed a deeper interest interest in fitness and started learning more about bio-mechanics. Realising that surgery only offered quick fixes he focused on the actual cause of the injuries. These were the many weakness in other parts of his body. The weaknesses came from a lack of core strength, balanced training, and flexibility. With this knowledge and accidentally attending a Bikram yoga class Man Flow Yoga was born. 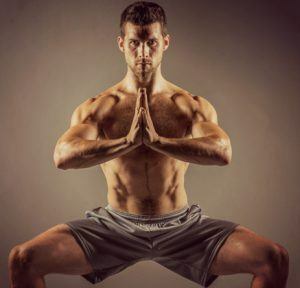 Learn﻿ more about the ﻿Man Flow Yoga st﻿﻿ory. Man Flow Yoga offers a unique product that combines yoga with fitness and sport. Dean’s style of functional yoga is effective whatever your current fitness level. By regularly following the programs and challenges you will improve your fitness and achieve your fitness goals. I had been doing yoga at a studio for nearly 2 years so had a good idea of what the practice entailed. At the time I was preparing to go traveling for 3 months. I was also keen to continue doing yoga and fitness training while I was on my travels. I had read a few articles about Man Flow Yoga and also seen some workouts videos on Youtube. The content looked informative and professional and I liked the instructor’s (Dean) style. From my experience having confidence in the instructor is the key factor in getting the most from yoga and other personal training. I was still not sure if Man Flow Yoga was the right program for me. The 7 day trial allowed me to get more information before fully committing to a longer membership. ​Man Flow Yoga membership offers great value. The most costly membership is cheaper than the cost of a single yoga class! It will include unlimited access to yoga workouts, programs, and bonus content. You can easily cancel your membership at any time if you decide it is not right for you. Becoming a full member of Man Flow Yoga has many benefits. Once you signup you will land on below members homepage. It has recently been redesigned and the look and feel is clean and uncluttered. Click on the image to go to short video that walks through the members area. I would highly recommend you spend some time in the Get Started area once you sign-up. It can be reached via the Menu button on the left hand side of the members homepage. This area breaks down all the content on the site so you are not overwhelmed. There is the Members Area success formula section. Here Dean explains the basics on how to get the most out of Man Flow Yoga. He doesn’t just focus on the workouts but emphasises a healthier lifestyle. Dean also discusses the importance of developing good habits in your training regime. There are 3 parts to making training a habit; planning, anticipating obstacles and keeping records. The MFY community is a powerful tool in the success formula. The community helps to create excitement, engagement, togetherness and accountability. 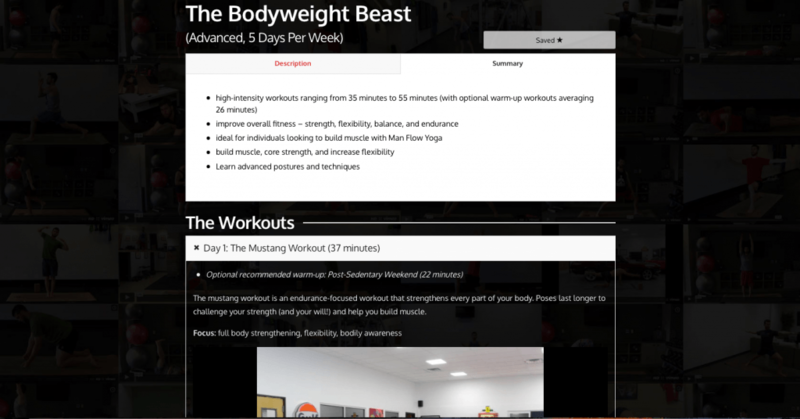 Finally there is the workout library where the majority of the MFY content lives. This is the area where you will find all the Man Flow Yoga workout videos. There are currently over 180 videos in the library so it could be quite overwhelming to find what you are looking for. Fortunately there are many filters available to find what you are looking for. Video duration: If you have a limited time you can find a workout to do in that time. The slider moves in five minutes intervals with the longest workouts sixty to seventy minutes. Target Area: Yoga is the best practice for targeting a specific area of the body. You will find workouts that will increase mobility and joint health for your wrists. Focus on your hips by strengthening your glutes, adductors, quadriceps, hamstrings, and hip flexors. Or tackle the issues of working at a desk by improving shoulder flexibility. Fitness focus: You can search for a workout based on your specific fitness goal. The options are very specific fitness areas like balance, flexibility, mobility and strength. You can also find more yoga specific options like flow, rehab and restorative workouts. Intensity Level: Choose your workout based on how hard you want to training. There are five levels of intensity, level 1 being restorative to level 5 that is extreme. You can also combine the filters so you can do a high intensity workout targeting focusing on your core. After 17 years of weightlifting, one bodybuilding competition, and too many injuries to count, I had gotten to the point that my workouts were no longer enjoyable. Since starting yoga, I’ve felt more energized and less beat up, but I don’t feel like I’m losing any strength. I have noticed my body seems to be “craving” the yoga workouts more. This may sound crazy, but I find my mind more energized as well. Heck, I’ve even felt a little calmer lately in stressful situations! I couldn’t be happier with this switch! Currently there are 23 training programs and 3 challenges in the members area but expect this to continue to grow. The training programs focus on a body part (back), a sport (running), a movement (squat), a challenge (Fit for Summer) or a function (mobility). All the programs are classified into 4 levels, beginners, intermediate, advanced and all levels. You can also choose programs based on the number of days per week you want to train. The options are 2, 3, 5 and 7 days per week and it is very easy to filter the programs. During my travels I was regularly doing the Bulletproof your Back and The Bodyweight Beast workouts. Phase 1, Build a Foundation: These are quick but effective workouts that will strengthen the source of the back pain. These videos have lots of instructions ensuring that you are doing the exercises right way with good form. The advantage of doing these exercises is that you will feel more comfortable when doing the flow in the future phases. There is also a 7 minute back pain relief workout that you can use at any time to manage back pain. Phase 2, Strengthen: These workouts focus on on strengthening your back as a whole. You will build strength in your hips, spine and core. This will improve your balance and build muscular endurance. A 20 minute nighttime routine should lessen any soreness you feel from any of the exercises. It is great to do before bedtime or after a workout. It is recommended that you do this phase for at least 2 weeks before moving to phase 3. Phase 3, Advance: In this phase you will add full body movements to your routine. You will still focus on strengthening your spinal health through hip mobility, core strength, and stability. Developing balance, strength and mobility in full-body movements is the goal of this phase. After doing this phase for a couple of weeks I benefited from more body control. 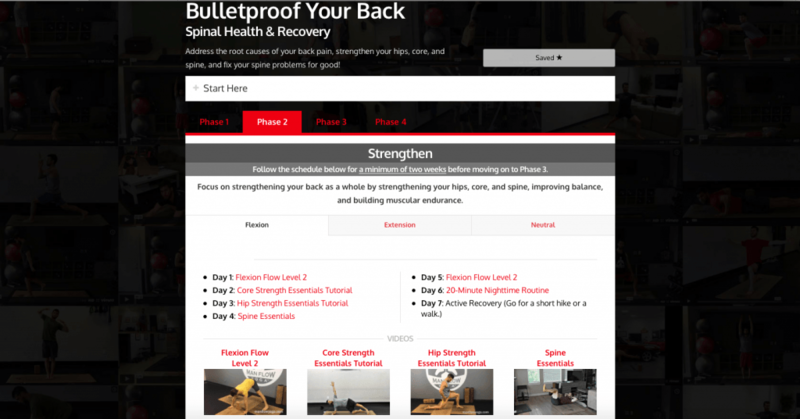 Phase 4, Bulletproofing: By this stage your back pain should feel dramatically different from when you started. You may still feel pain from time to time, but you now know what you need to do to fix it. Phase 4 focuses on improving strength and mobility. Workout are more difficult and longer but will now be ready for them! If you are still feeling discomfort in the back it could be due to you not using your hips or core enough. The 20 minute hip and core essentials flow workouts will ensure that you become more conscious of engaging them. Do them at the beginning of the week for better full body movement. As a 55 year old man with chronic back pain and degenerative osteoarthritis over the last 30 years, I approach any fitness program with caution and a fair amount of cynicism. Having said that, I’ve been following Dean’s program for over a year now, and I couldn’t be happier with the process or the results. Since I’ve began training with Dean, I feel significantly better, both mentally and physically, than I did when I started ManFlow. My flexibility, stamina, core strength, balance, and coordination are all dramatically improved, and most importantly my back feels better and less painful than it has in many years – all of which I attribute to Dean’s program. My body is now significantly more toned and fit – not only can I see and feel it, but many others including my massage therapist and physician have noted (without me prompting them) the positive changes in my body and attitude. ​This workout is the perfect proof that yoga can be high intense and build muscle. It is a very challenging 5 day workout and you will definitely appreciate the 2 rest days! The high intensity workouts range from 35 to 55 minutes in length. There are also optional warm-up workouts that I recommend at the start of the week. They focus on combating the effects of sedentary activities such as long hours driving in a car or lounging on your sofa. Also excellent for activating muscles you haven’t used for a while. Doing this workout on a regular basis, you will improve your strength and strength. Many of the poses require good balance, endurance and flexibility. There is a strong focus on building core strength so if you are looking for a 6 pack, this is the workout for you! Finally you will learn some advanced postures and techniques. Day 1, The Mustang Workout: This a workout done in a car dealership in front of a beautiful Mustang! An endurance-focused workout that strengthens every part of your body. You hold poses longer to challenge your strength (and your will!) and help you build muscle. It is a great workout along with the Post-Sedentary Weekend to start the week. You will sweat buckets and feel amazing afterwards. You will also be impressed by Dean giving instructions while holding planks and forearm planks for 1 or 2 minutes! Day 2, Keeps the hips squared: After the intensity of Day 1’s workouts we switch focus to core engagement and posture technique. The emphasis is on core engagement and proper, neutral pelvic alignment in a variety of postures. One of the big problems seen in yoga is that many people try to go too deep into many poses. This can cause problems and injuries as you are not doing the pose for your body. Focusing on technique rather than depth has many long term benefits and lessens the likelihood of injury. This is a fantastic workout to help build strength while at the same time reinforcing basic (but essential) technique. Day 3, The Pyramid Workout: One of the features of Vinyasa flow yoga is building a sequence of poses and flowing through them. It is a great way to build endurance and improve technique as you are repeating the poses. The pyramid workout involves building a sequence of poses, one on top of the other, for a progressively difficult workout. You will need strong focus and endurance to complete this workout. There is a lot of lower-body strengthening and spinal mobility and few new and advanced poses. It lasts for 50 minutes and expect to feel the burn! Day 4, The Fix Workout: The reason yoga is so effective is that it targets all areas of the body. I find it the most addictive training you can do. This is because no session is the same and impacts your body differently. The fix is a 45 minute full body workout that is very challenging. Also the more you do the workout you will notice the different way it affects your body. This workout includes many strength building and flexibility poses and combinations. It will provide a full body, full spectrum workout. The workout consists of lots of upper body, back and forward bends. It also includes many lunges and squats as well core exercises. If you are looking to build muscle, core strength, endurance and flexibility, The Fix has you covered. Day 5, The Perfect Squat: There are many benefits of having a great squat and reliable squatting technique. You will have bigger and stronger legs as well as more core strength and a healthier spine. This workout will build strength for squats by focusing on the lower body and back and core strengthening exercises. You will develop strength, range of motion and endurance necessary for increasing weight in your squats or doing more reps. This workout has some new exercises so expect to be challenged a lot. You’ll develop your strength, activate your muscles, and improve your flexibility with this 62-minute beast. Personal Training with Dean provides you extra direction and motivation. Sometimes you need accountability to help you reach your fitness goals. Get everything you need to ensure sustainable, long-lasting results – as quickly as possible. Man Flow Yoga personal training includes a personalized plan. This will be a workout plan based on your specific goals. The plan will take into account your fitness history and levels. You will get two monthly 15 minute video or voice calls with Dean. The purpose of the call will be to review your current training plan and measure progress. Dean will then update or your training program to ensure you stay on track. Throughout the training program you will have unlimited email support and receive regular feedback. Dean will let you know if you are slacking and will help you stay motivated. Wellness is an important part of Man Flow Yoga. To achieve your fitness goals it is vital that you take care of your well-being. This means you are following a balanced diet and understand the basics of nutrition. The lifestyle you lead can also impact on whether you stay on track with your fitness. Staying motivated in one of the keys in maintaining a consistent fitness program. The wellness library has lots of content that covers diet and nutrition, lifestyle and motivation. Dean covers many topics that vary from what you should eat for breakfast to whether yoga can increase testosterone. Much of what he discusses comes from personal experience and if he recommends any product or service you can be sure he has tried them before. The wellness library also includes over 130 MFY shorts. These are twice Weekly Videos that teach you new exercises to keep you engaged and accountable. These are no longer than ten minutes in length and focus on one topic. This could be a specific yoga pose like crow or dolphin. Dean will breakdown the pose and show you the simplest and safest way to do it. Or it could focus on an issue that is popular at the time. Such as fat burning misconceptions or the proper posture for sitting in a chair. Did you know that workout programs are more likely to succeed when there is a community element involved? By joining Man Flow Yoga you will be part of an active, inspirational fitness community. This community will provide motivation for you to achieve your fitness goals. You will get accountability and support as soon as you join the program. This community ensures you are dedicated to improving their health and wellness. Members can engage with the community by using the community forum on the website and joining the MFY Facebook group. Members can get paired with a Manbassador by taking a quick survey. Manbassadors are not personal trainers so they cannot prescribe you workouts, give you a meal plan, etc. They are there to help motivate you and encourage you! Historically most yoga classes available online focus on the traditional yoga aspects. Recently more courses are offering a wider range of services combining yoga with other fitness activities. This is a very diverse site dedicated to healthy living and an active lifestyle. It has a lot of content, well over a thousand yoga classes. There are also other cardio, HIIT, pilates and strength and weight training classes. You can also find information on healthy living through blogs and videos. The site has a strong social media element. The platform allows you to follow other yogis, specific topics and interact with other people. 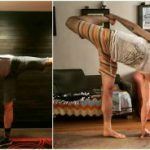 Grokker is definitely an up and coming site and has enough content to cover the demands of most yoga and fitness enthusiasts. It is suitable for newbies and experienced users and is great value for money. It compares well to Man Flow Yoga, it is cheaper and there is more content. Grokker offers a 2 week free ﻿trial with a personalised program designed and customized to your goals. If you are looking for a quick, physical yoga workout, Dirty Yoga is a great option. They offer intense, streamlined workouts so you can get back into shape as quick as possible. The weekly workouts vary to ensure you get fitter and stronger in just 120 minutes per week.​The programs are more for someone who hasn’t done yoga previously and focus on fitness. Dirty Yoga approach is quite refreshing and they are realistic on how yoga can help you achieve your fitness goals. Classes are 30 minutes in length for a down and dirty workout, and you get new classes every Monday, meaning you never have to repeat a class. Classes are typical vinyasa flows: intense, fast-paced, sweaty, and fat-burning. There is plenty of cheeky humor during workouts and on their website. Dirty Yoga doesn’t offer a free trial but you can get a week's pass for $10. The biggest drawback is that the classes are only viewable for seven days. Once Monday rolls around, last week's classes disappear and you get the new set. This can be frustrating for some people but if you are looking for variety, Dirty Yoga will offer plenty. A little over 5 years ago, at 280 pounds, I decided that I would change my relationship with food and start working out. But I hate exercise. And yoga… Well, I liked the idea of it, but could not stand the prevailing pseudo-religious culture. Or the music. Then I found Man Flow Yoga. Physical & Functional. AND NO GODS CURSED BACKGROUND MUSIC. And here I am, 5 years, 80lbs lighter, and a harrowing cancer treatment/surgery later. Still doing Man Flow Yoga. Still yelling at video-Dean during difficult poses. 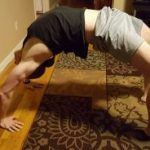 Man Flow Yoga keeps me flexible when lifting weights, limber when running, and helped me recover from surgery. Plus I actually enjoy it! Man Flow Yoga believes that getting and staying in shape should be a simple process. By doing the right exercises and investing 20 to 30 minutes every other day you will see great results. If your goal is to stay healthy, injury-free and mobile, MFY workouts are exactly what you need. Yoga isn't a complicated practice but it can be intimadting at the start for men. It is vital to build a strong foundation based on excellent technique from the start. Man Flow Yoga is yoga for men and women that focuses on the technique above all else. Dean Pohlman always provides clear and detailed instructions which ensures you are always know what you should be doing in each posture. Furthermore whether you are a complete beginner or have been doing yoga for a few years you will always learn more to advance your practice. The focus is on the physical aspects of yoga compared to more traditional styles so you can get the maximum benefit out of each posture. You will understand exactly what each exercise is doing for your body, so you understand the benefit to your functional fitness. Man Flow Yoga is full of great content. The videos are HD quality and can be downloaded for your connivence. It contains lots workout programs for all levels and experience with new ones being added regularly. The site is well designed, clean, uncluttered and very easy to navigate. You can save your favourite workouts so you can access them easily. 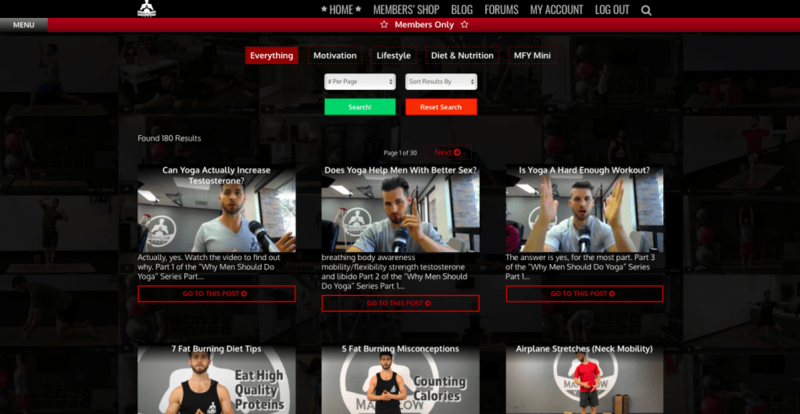 The workout library allows to you filter all the videos by time, skill level, target area, fitness focus and intensity level. Membership offers great value with the most costly membership being cheaper than the cost of a single yoga class! So whether you are competing in a triathlon, being a weekend warrior, playing sports, or playing with your grandkids, MFY has lots to offer. You will build the basics of your physical fitness and see major improvements in your balance, core strength and flexibility. Finally the uniqueness of yoga workouts will result in more body awareness, endurance and better movement patterns. I am an easy going and sociable adventurer. My main hustle is helping run Australia’s number one community marketplace. I am an inflexible Yogi, functional fitness warrior and beginner boxer. I am huge Wire fan and enjoy watching well written film or TV. Woodwork is my latest passion and dream of having my own workshop or just a small toolshed! Currently listening to my favourite community radio station while making dovetail joints.